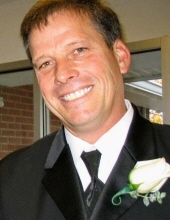 Mark Stone, 58, of rural Robinson, IL, died Friday, February 8, 2019 at the Crawford Memorial Hospital in Robinson. He was born August 12, 1960 in Olney, IL, the son of Edward Roy Stone & Anna Lou (Buerster) Stone. He married Amy L. Simons on February 15, 1989, and she survives. He is also survived by his children & their spouses, Amy & Jeff Mossman (Jacksonville, IL), Nicole Smith (St. Peters, MO), Dillon & Jodi Stone (Robinson, IL) and Emma & Blake Callaway (Robinson, IL); by his grandchildren, Bryson Mossman, Nolan Mossman, Griffin Mossman, Callan Mossman, Colton Smith, Avery Smith, Brecklyn Stone; by his mother, Anna Lou Stone (Oblong, IL); by his siblings & their spouses, Diane Houdasheldt & Dennis Hasty (Oblong, IL), Susan & Tony Madlem (Oblong, IL), Steve & Rosemary Stone (Chatham, IL), David & Gina Stone (St. Joe, IL), Julia & David Turner (Bloomington, IL), John & Michelle Stone (Newton, IL), Michael & Cheryl Stone (Indiana), and Brenda & Heath Womack (Texas); as well as several nieces and nephews. He was preceded in death by his father, Edward Roy Stone. Mark grew up in the Ste. Marie area and was a 1978 graduate of Newton High School. For 37 years, he worked for Marathon before retiring as a pipeline supervisor in July of 2018; but not before providing his many co-workers (and everyone else, for that matter) with nicknames that would stick with them for the rest of their lives. In 2016, he and Amy opened Stoney Ridge Event Center, and in doing so, they brought a great service to their community. Mark Stone was, by all accounts, an extraordinary role model. He worked hard and loved with the entirety of his heart and soul. He had a smile that could light up any room he walked into, and his hugs were the stuff of legend. Friends and family could never forget this one-of-a-kind soul, or the light he brought into each of their lives. A time of visitation will be held from 3:00-7:00 p.m. on Wednesday, February 13th at the Goodwine Funeral Home in Robinson. A memorial service will be held at 7:00 p.m. on Wednesday at the funeral home with his good friend, Dennis Inboden officiating. During the service, there will be an opportunity for family and friends to share their favorite memories of Mark. In honor of his love of children, memorials may be made to “Riley Children’s Hospital” or to Layton Strong, with checks made payable to the “Layton Roy Benefit Account”. Envelopes will be available at the funeral home. To send flowers or a remembrance gift to the family of Mark Stone, please visit our Tribute Store. "Email Address" would like to share the life celebration of Mark Stone. Click on the "link" to go to share a favorite memory or leave a condolence message for the family.